One of the things that made last years "Guardians of the Galaxy" so much fun was the tone of the story. Yes it did feature a threat to the entire universe and that is pretty heavy, but every character who was conflicted and depressed at times, usually had a sense of humor and the whole enterprise came off as fun rather than angst inducing. The big Marvel film from earlier this year "Avengers: Age of Ultron" is weighed down with sad backstory and depressing philosophy and while it was entertaining, it was also very heavy. This film and story manages to be closer to the Guardians end of the spectrum rather than the Avengers end. Even though there are Avengers tie ins, this is a lighter, more amusing take on the super hero mythos and a solid way to launch another character from the Marvel Universe. My kids have accused me of having a man-crush on Paul Rudd. That is mostly because he stars in the greatest film of 2008, "Role Models". He is a surprising choice for a super hero movie but a very reasonable one for a comedy, and there is a lot of comedy in this film. While he is not a physical specimen like Chris Helmsworth, Rudd is in good shape and has an appealing face that is average rather than chiseled. His selection reminds me of the decision made before the first Tim Burton Batman film, to cast comedic actor Michael Keaton as the Dark Knight. The suit will do the action material just fine, it is the story that takes place around those scenes that requires the right kind of choice and this one is a hit. Rudd has a sardonic quality to his voice that matches well with the disillusioned ex-con who goes to prison for being a crusader in a hacking scheme. He is given enough background for us to sympathize with him but we also know he is capable of making a bad choice or two. The original "Ant-Man" is Hank Pym, played by Michael Douglas. There is an early scene where the CGI budget for the film is largely spent on making Douglas his "Romancing the Stone" are once more. It is very effective and the change in appearance to more contemporary dates is almost startling. There is some exposition about how he lost his company to the apprentice that is now running things. Darren Cross (perhaps not the most subtle of name for a villain character ,-D.Cross) is a genius but has apparently given in to megalomania in part due to exposure to the processes required to develop the material that allows a man to reduce his size to that of an insect. That Pym still has contact with the company as it is reaching a critical deal point is a little hard to believe, but than it is typical of this format that the acolyte wants to impress the mentor as he passes him by. Corey Stoll is a familiar face from action films and TV shows and this is his chance to step into what would usually be the role played by Mark Strong, who was I guess, not available. Some of the powers of "Ant-Man" are a bit strange. The ability to control ants sounds like one of the oddest super powers to come along. I'm surprised that President Obama did not have it on his list instead of being able to speak all languages. After all, ants outnumber humans substantially and if universal communication is important, you ought to start with the creature that is most prevalent on the planet (outside of termites anyway). 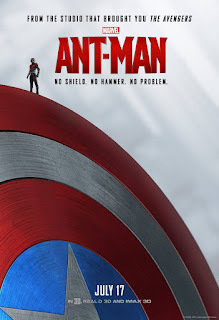 The ant connection allows a lot of problems to be fixed in an interesting visual manner, and Scott Lang ( alias Ant-Man) manages to make a humorous connection to the creatures and even imbue one of them with enough emotional weight that what happens to one of billions of insects may actually matter to you. The speed with which he can change size and escape detection is also pretty cool. There is a technology though that seems to minimize this advantage and that makes a fight scene in the middle and end of the movie work a little better. Scott also has a couple of weapons that Hank has created for him that harness the molecular technology that powers the suit. Not much time is spent explaining them but when they are used they both create reasonable solutions to situations and amusing comedy bits as well. Evangeline Lilly is Pym's disaffected daughter and she will have an important role to play, but right now she is not really a romantic interest for Rudd as Scott. The ex-wife and mother of Scott's daughter is played by Judy Greer, in her fourth movie of the summer season (Jurassic World, Tommorowland and Entourage) but as in those other films, she is underused ( and today just happens to be her birthday, so Happy Birthday Judy). Bobby Cannavale plays the cop/future step father to Scott's child and he doesn't get the suave role he had in "Spy" but he does get to do the comedy material pretty well. Michael Peña does comedy as well and the way he tells a story, reminds me too much of some people I know. Overall it is an interesting cast and the tone of the film is a good change of pace for these comic book films. It looks like there are some future adventures that we will not have to wait to long for, if you have not yet heard, you should sit through all of the credits. Hey! Well, first of all, your post reminds me of how urgently I need to watch "Guardians of the galaxy". It's on the top of my list. And despite all the disagreements regarding Age of Ultron, we do agree regarding Ant Man. I really enjoyed it. I admit I went in with no expectations whatsoever and was very positively surprised. Still doesn't top Avengers and Captain America for me but it was a fun ride. One I would be more than willing to take again. The movie is a place holder that tries to introduce a little known character and still remain a part of the Marvel Cinematic Universe. I think it largely succeeds and it will be fine on repeat viewing.